Well today is the day. The latest in the Assassin's Creed storyline has been released to the masses. 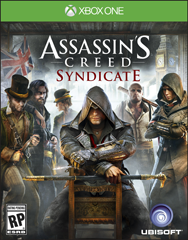 AC Syndicate has thrown itself onto the Xbox One and PlayStation 4 (PC soon!) and I can tell you this: MUCH BETTER than Unity folks. I think you're going to like it and enjoy it like we have been all week. It feels like a fresh start from the last two games and you're going to feel like you can get involved and feel the characters unlike the last game which was, sadly, dry when it came to the feels. Taking place in Victorian London, you are set right in the middle of the Industrial Revolution circa 1868 playing as either Jacob or Evie Frye. Assassin Twins that just arrived in town looking to do some things that only an assassin would need to do. The really nice thing about the Frye twins is that two of them have their own agendas within the game. Jacob is looking to reclaim London from the Templar control that has existed over it for so long by making his own gang, "the rooks" and killing off anyone gang related in his way. Doing so will in turn bring London back to the people. Evie on the other hand has some leads on Pieces of Eden and she will do all she can to do that. Because of this split between them, you are able to play either twin as needed until you hit a specific mission that is setup specifically for one or the other. This means that yes, you can in fact play Assassin's Creed as a female. Something that has been needed for a very long time and there is lots on the internet for you to read on. I'll admit, I like playing as Evie because she is a gloriously torturous woman when it comes to dispatching her enemies. As with all games, you will need to level up your character as you play and the skill tree for each assassin isn't super complicated. And to make things even nicer, skill points earned on one twin is also earned for the other twin, thus you don't have to worry about only leveling up one twin and ultimately never using the other because of their poor skills. This really made sense anyways because you can't move the story and timelines along in a decent manner without this. Visually, London looks great and Ubisoft really does a fantastic job with their historical architecture designs and implementation. I am sure things may be off a little here and there for the use of having a human climb it's structures with ease, but you get the feeling that London was a dirty place ripe with all sorts of goodies in the gutters only to be washed away to the Thames via the rain that falls upon you at times. This is very good bowl of eye candy and sometimes you want to just sit back, relax, and look at the beauty bustling all around you. The inhabitants of the city are as always holding conversations about various things and some of it is rather entertaining because of their period style chit chat or the topic at hand. As with all Assassin's Creed games, you're going to be taking care of a super bad Templar and the one being dealt with in this time period, Crawford Starrick, is pretty brutal with his execution of making things go his way. Either he is going to handle everyone with an iron fist by utilizing a brutal gang to roam the streets, distribute a super syrupy drug to calm the masses, or if he has to, make sure those kids working in the mills and foundries work fast and furious before they break from the labor or dangers at hand. This is how things were done back then and AC doesn't hide it from you. In order to make your way across London, you can traverse by foot, rooftop, or carriage. But even then those are not really fun anymore because this iteration of Assassin's Creed gives you a rope line tool attached to your gauntlet. Modified by Alexander Graham Bell early in the game, this allows you to traverse in a super fun manner. Whether you're looking to get to the top of a super tall building for the synchronization spot or needing to hang a line between two spots to allow you to hang over one or two people for a double assassination is great. This really is a fantastic change in the game and I hope it is here to stay because it allows me to get my parkour in as well as do some fun travel quickly up on the sky. As I mentioned earlier, you will skill up Jacob and Evie mostly equal as you move through the missions and gain experience. Jacob is more for the brawl like fights and therefore you'll begin to want to skill him up for those tasks at hand first. Evie is more stealth like and on the skill tree you can see between each skill a little icon indicating one of the twins or the other that it will be better suited for, but in the end you'll max the twins out and they are fairly interchangeable as you progress along the many many side quests you can do in such a large open sandbox world. You will be killing people and the battle system has been updated to be more fluid, quick, and downright brutal at times. Evie sure knows how to use her cane, the sword within the cane, and every other little hook on there in which you can impale and cut the person in front of you. The game of course does have a couple of things that I have found bothersome while playing. The biggest one for me is that because you can climb on virtually every object within the game that doesn't have legs, sometimes moving from place to place in an attempt to parkour all over the place just doesn’t' work. I've ended up stuck on a handrail because I was holding down the right trigger for a running parkour move and I'll end up scaring an enemy losing my silent kill ability or I'll be stuck on a wall moving around a spot I want to get to because the game is in a mode it thinks I want to be in. I don't really fault the developers on this but it felt like a bit of the same problems I had when playing Unity as well. When things start to get super complex, the rules at hand for navigation are getting a bit more complicated. Also at times, the games loading screens can take what seems to be forever, but not always. I'm not sure if this is because a major scene is taking place and everything in it's glorious mode needs to be loaded or there is just a lot going on, but it does happen. Overall, this iteration of Assassin's Creed really is great. I believe Ubisoft has truly recovered from the last game in the series and I believe you will as well. Large, in charge, and lovingly brutal, Syndicate has it all with lots of hidden gems all over the place in a direction I think we are going to be seeing the game go. A modernizing Assassin and his toolset slowly being displayed with the present day cutscenes you see between the major missions within the game. It only makes sense because we are following the history and timeline with concerns to the previous Assassin/Templar Hatham Kenway. If you haven't already, go out now and pick this up for platform of choice and get your twin assassin going on.